Barn Owl Lodge near Carsington sleeps 4 people. Barn Owl Lodge near Carsington is a semi-detached cottage which has been thoughtfully and lovingly decorated throughout with contemporary and comfortable furnishings. Located within the owner’s grounds you are only a short walk from Carsington Water. Each of the two bedrooms’ interior design and furnishings are exceptional, and the large open plan living area has an eyecatching wood burner which is ideal for cosying up to on cold winter nights. From the doorstep you can enjoy spectacular views over the Peak District National Park with its rolling hills and breathtaking scenes. Although not a working farm, Millfields Farm, where Barn Owl Lodge sits does have some friendly residents for you to meet, which include two potbellied pigs, two Shetland ponies, geese, chickens and ducks. 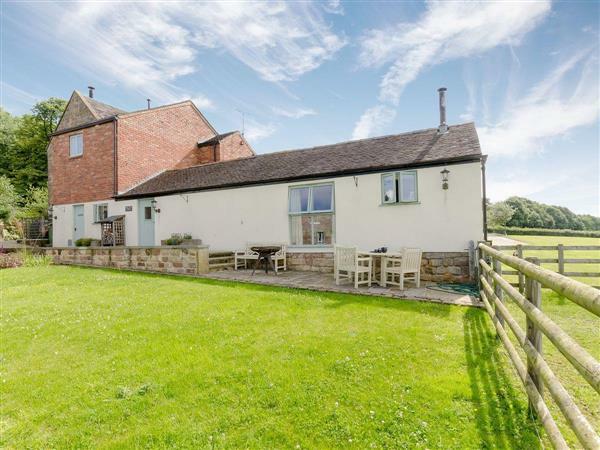 It is ideally situated at the southern tip of the Peak District near the picturesque market town of Ashbourne with its quaint cobbled market place and hidden alleys to explore. Carsington Water is a mere 3-minute walk away offering superb water sports, sailing and bike hire facilities with an area devoted to wildlife along with cycle and walking trails. Other places to visit nearby include Bakewell, Matlock Bath, Haddon Hall, Chatsworth House and Keddleston Hall, as well as other National Trust and English Heritage properties. It is only a short drive to Dovedale and the other lovely dales of the limestone White Peak District, which offers great walking. A little further afield, visit Alton Towers theme park for a great day out for both adults and children alike. The shop is 2 miles from Barn Owl Lodge near Carsington, with the pub and restaurant 1½ miles. Barn Owl Lodge can be booked together with Swallow Barn (ref UK4023 [Swallow Barn]), Curlew Farm (ref UK4024 [Curlew Farm]) and Woodpecker Lodge (ref UK4022 [Woodpecker Lodge]) to accommodate up to 23 guests. Ground Floor: All on the ground floor. Kitchen area: With electric oven, microwave, fridge/freezer, dishwasher and washing machine. Gas central heating, electricity, bed linen and towels included at Barn Owl Lodge near Carsington. Welcome pack. Patio with garden furniture and Bar-be-que. Bike store. Private parking for 2 cars. No smoking. Please note: There is direct access to the unfenced lake through the owner’s garden, 500 yards. Holidays at Barn Owl Lodge run from Friday to Friday. For a better idea of where Barn Owl Lodge is, you can see Barn Owl Lodge on the map below. Barn Owl Lodge is in Derbyshire; should you be on the lookout for a special offer, you can find all the special offers in Derbyshire. It's always worth checking to see what is on offer at the moment. Do you want to holiday near Barn Owl Lodge (UK4025), you can see other cottages within 25 miles of Barn Owl Lodge; have a look to find your perfect holiday location.